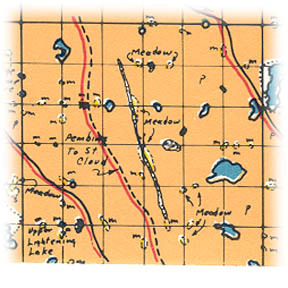 Aastad township (township 131, range 43) was organized March 14, 1871. The petition was dated December 29, 1870, contianed the following legal voters: John Nilson Hoff, Helge Nilson Gverna, John Christianson Stemmerodden, John Erikson Kasa, Ole P. Backe, Guttoem Ole Sentasted, Austin A. Boe, Jens Erikson Platon, Peder Gunderson Bache, G. P. Backe, A. O. Anderson, Jens Rasmuson, Gilbert Syverson, Sever Hermandson, Pear Thomson Elingboe. Elland B. Brakke, Henry Olson Holo, Peder Haastad, and Anfind Olsen Aggam. It is interesting to note that the entire list of nineteen signers were all Norwegians. This gives an idea of the early settlement in this township. The first election was held on the third of the following month at the home of Osten Aslagson, who is still living in the city of Fergus Falls. This was the sixteenth township organized in Otter Tail county. It lies.in the southwestern part of the county and is bounded on.the north by Buse, on the west by Western, on the south by Grant county and on the east by Tumuli township. The taxpayers of Aastad township in 1870 were as follow: Dorothea Maria Olson, Andrew Olson, Ole J. Larson, Clearland J. Salter, Osten Aslagson, Lawrence Brainard, Torsten Loftus, Gulick Knutson, Ole Springer, Gunder Gulikson, Knut Gunderson, Thomas Brennan, John Nelson, Richmond Wolcott, Frank W. Tracy and Jens Rasmussen. Mustinkee or Rabbit river flows through the central part of this township. It has a fall of one and one-half feet to the mile and is wide in some places, more of a slough than a river, covering much ground and forming swamps. There are some thirty odd lakes in this township, varying in size with Mud lake as the largest. This lake has an acreage of one-half section. Halfway, Bakke, Stav, Duck and Ryden lakes are all narrow but the smaller lakes bear no name. The elevation of this township ranges from one thousand two hundred and fifty feet in section 2, to one thousand one hundred feet in section 7. The St. Paul, Minneapolis & Manitoba railroad, Great Northern, as originally surveyed, passes diagonally through this township. Much of the grade had been made, when the panic of 1873 stopped further work on this road. Unfortunately for this township, but fortunately for the county when work was again resumed, the survey was run farther east and missed this township entirely, but passed through the county seat. There has never been a town platted within the limits of this township although there were three postoffices in the southeastern part for a number of years, namely, Hastov, Squier and Littemore, but these have been taken over by rural routes and abandoned. The present township officers are as follow: Lars Simonson, A. E. Soliah and A. P. Haarstad; clerk, John Thorson; treasurer, E. H. Bergerud; assessor, Iver Haarstad; justices, M. F. Bergerud and O. T. Hole; constables, Gust Anderson and Theodore Thoresen. Places of birth for Aastad Township in the 1905 state census.